Aly Dosdall: Island Adventure, and...buh-bye! 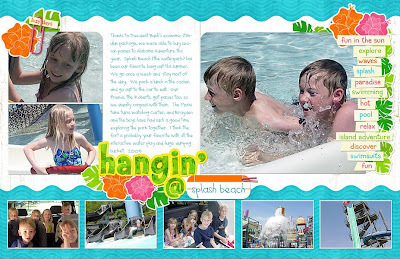 So, this is where we hang out once a week this summer--Splash Beach at the Alabama Adventure theme park. Had to do a layout about it of course, b/c it's become such a part of our summer lives. Used this adorable summery "Island Adventure Elements" kit by Angel Hartline. She just launched her own digital designs website and you must check out her stuff...love it! I also did this layout based on a sketch from a Debbie Hodge class that I won for free. She teaches online scrapbooking classes and is a great teacher...I highly recommend her! So...with that I leave you to ponder for a few weeks. We'll be out of town so I won't be blogging 'til we get back. Enjoy your summer and happy scrapping!! Great pages! Have a great trip! Beautiful. I admire your style with the digi also. I finally used my RAK and order and bunch of "Quick Pages" from pclayers. I'll start with quick pages and work my way up from there. I think it will be fun.